If you’re confused over the difference between the many image file types, you’re not alone. When starting off a project, one of the first things we request from the client is a vector file of their logo. However, that request is often met with blank stares or responses like “can’t you just pull the logo from my site?”. As a marketer, understanding the importance and role of different image file types is essential to ensuring your brand is properly represented and to better communicate with designers, developers and printers. Download our Image & File Types Cheat Sheet. Download it, print it and save for future reference. What is a vector file? 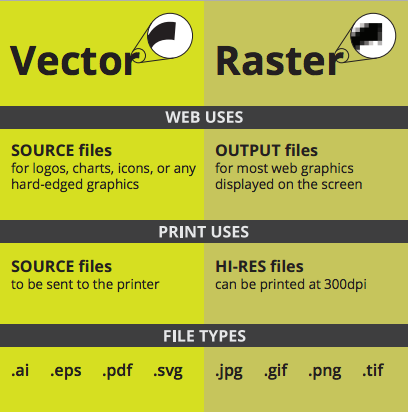 What is Raster? We can start making sense of the issue by clarifying the difference between the two major image types – raster and vector. Raster images use many colored pixels or individual building blocks to form a complete image. JPEGs, GIFs and PNGs are common raster image types. Almost all of the photos found on the web and in print catalogs are raster images. Because raster images are constructed using a fixed number of colored pixels, they can’t be dramatically resized without compromising their resolution. When stretched to fit a space they weren’t designed to fill, their pixels become visibly grainy and the image distorts. This is why altered photos may appear pixilated or low resolution. Therefore, it is important that you save raster files at precisely the dimensions needed to eliminate possible complications. Vector images, alternatively, allow for more flexibility. Constructed using mathematical formulas rather than individual colored blocks, vector file types such as EPS, AI and PDF* are excellent for creating graphics that frequently require resizing. Your company logo and brand graphics should be created as a vector and saved as a master file so you can use it with smaller items such as your business card and letterhead, but also on larger surfaces, such as your corporate jet. When necessary, always create a JPG or PNG for use on the web from this master vector file. Just be sure to save the new raster file in the exact dimensions needed. *A PDF is generally a vector file. However, depending how a PDF is originally created, it can be either a vector or a raster file. Whether you opt to flatten the layers of your file or choose to retain each one will determine the image type. High Resolution or Low Resolution? To determine whether your raster images are a suitable resolution for a specific application, you need to check their pixel density. Units of measurement such as dots per inch (DPI) or pixels per inch (PPI) refer to the number of pixels in one inch of the image. These measurements become important when you attempt to use raster images in specific places, such as on the web or in print publications. The web, historically, displays 72dpi (72 dots or pixels per inch) – a relatively low pixel density however most modern displays are now much higher. That said many images on the web are still in that 72-100 dpi range. While monitors can display higher resolution the web also needs to optimized for speed so images around 100 dpi hit the sweet spot for looking great on a screen but also loading quickly. Raster images with a low DPI in the 72-100 look nice and crisp on the web. But this same low DPI image may not be suitable for printing on a brochure or packaging. 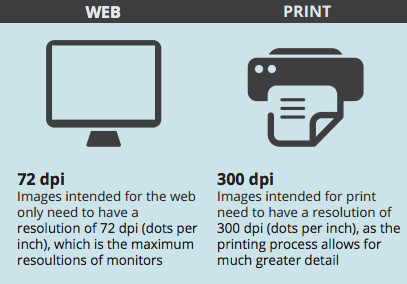 To correctly print an image, it should be at least 300dpi, a much higher pixel density than the web displays. Resizing a low DPI image pulled from the web to fit the dimensions of your print project won’t work because the same finite number of pixels only get bigger and begin to distort. For example, let’s say you want to print your logo at 2″x3″ on a brochure. If have a 72dpi jpg of your logo and it’s 2-inches by 3-inches, it will need to be “stretched” to more than 3 times the size to get it up to 300dpi. That 72dpi logo may look great on your computer monitor, but when it prints at 300dpi it will look pixilated. Instead you should use a vector version of your logo (.EPS or .AI) or create a raster (JPG) with the exact dimensions desired and at 300dpi. At MODassic we often create files in Illustrator and save an AI file as our master file, but then also save an EPS version, “in outlines” which is used in production and sent to print. Saving in “outlines” is a term that you will hear when sending files to print. If a printer doesn’t have a font you used in your design and the vector file is not saved in outlines then when they open the file the text won’t have the desired look as it will default to a different font. Saving something with “outlines” basically means you are locking the text so that it’s no longer technically a font but instead made up of vector shapes that form your letters. This is important when sending graphics to print. Saving a file in outlines makes your text no longer editable which is why at MODassic we keep the AI file as an editable master and then save an EPS as the locked final artwork which we send to print. Working with images can be confusing, but bearing these key facts in mind will eliminate much of the hassle and of course we’re always here to help or answer any questions.